2015 has been a landmark year! I don’t want to sound like I’m bragging, but I can’t help the truth of it. There have been some amazing things that happened this year, some of which I’ve been wanting or working toward for a good portion of my adult life (some since I was a kid, even). From getting a publisher, to moving into a new place and even winding up in the hospital at one point, 2015 was filled with incredible ups and downs. So pull up a comfortable chair and pour a glass of eggnog. It’s time for my annual reflections on the year past. Like last year, so much seemed to happen in the twelve months from my reflection post last year to this one that I hardly know where to begin, nor that I’ll be able to do any one thing justice for the sheer amount of things to write about. Much of what happened this year was already in motion in 2014. 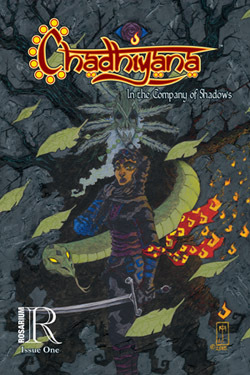 At the end of last year, I was just beginning to write a non-fiction book and was secretly in talks with Bill Campbell of Rosarium Publishing about them becoming the publisher for my graphic novel, Chadhiyana: In the Company of Shadows. It was only a month or two later that I’d completed writing the book and signed with Rosarium, and to add to it, I’d taken the time off from Chadhiyana to illustrate my first children’s book (which I believed, at the time, I also had a publisher for). And on a smaller scale, I finished publishing the final parts of my Handlebar Moustache Guide and added new graphics to this site. That was how the year began: one book under contract with a publisher, another written and a third illustrated (having been written some years before). All of that was a great accomplishment in itself, even for a full year, and I still had three quarters to go. Though I honestly would have been happy enough with just that. After all, getting a publisher for a book which I had written and illustrated has been a dream of mine since I was a kid, and for that book to have been Chadhiyana was more than I could hope for (as I’d written about at length in March). Never mind that I’m very happy with Rosarium as my publisher (something, I know, not all creatives can say). Truth be told, the following months were not quite as seemingly prolific. The wheels of publishing move slowly, though I did begin my largest and most successful convention tour from April to October. It seems, for the most part, every convention I attended was more successful than the last, ending finally with the New York Comic Con which beat out all the others, even compared to previous years at that and other shows. Within that span of time, I moved in with my girlfriend and her daughter and found myself with the great fortune of finally having a space (a room, really) solely dedicated to my studio and office. Also, the first two Chadhiyana issues were released to positive reviews and a couple of mentions on the comiXologist podcast. 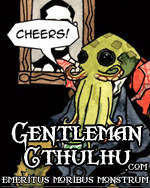 I was also approached for an in-depth interview with Sequential Tart, and of course, there was the launch off my new web-comic, Gentleman Cthulhu: Emeritus Moribus Monstrum (gentlemancthulhu.com) on H. P. Lovecraft’s 125th birthday. I even opened up commissions for the first time (outside of convention appearances). Add all of this to the first three months, and I really feel that I can look back at this year quite satisfied. Of course, that’s not to say there were not hardships. I experienced a terrible creative funk during the end of the summer and the beginning of the fall (we creatives all go through it–and I’m beginning to learn more and more as time passes that this sort of thing is merely a hazard of the work I do). Worse still, toward the end of September, I was experiencing intense stomach pains which eventually landed me in the hospital with a diagnosis of diverticulitis. I had no idea that I was prone to the condition, as I’ve always had a stomach of iron, but likely the cause was stress not diet. Fortunately, the attack was not so bad that I had to miss my good friend’s wedding (which was happening that same week), but it did take its toll on me. I decided to make some changes to my lifestyle, and hopefully I’ll never experience that pain again. Still, in an effort to take it easy on my stomach for a while, I was finally able to drop back down to a weight I am comfortable with (which I’d been struggling to do for years, despite regular exercise). So, something good did even come of that. As I said, it was quite a year, and for all that happened, I don’t feel I am able to give the proper amount of attention (or words) to any one thing (and indeed, I may have even missed a thing or two). There were challenges and adjustments throughout and even a few hurdles, but I have to say it was a year to be proud of. I am immensely happy with it, if for no other reason than finally getting a publisher (thank you again, Rosarium Publishing; you made my dream come true). So, despite not being able to write enough about it, I close this year exhausted yet satisfied. I think a lot of ground was covered and some major foundations were laid. I look forward to continuing to grow as we all move forward into 2016 and beyond. And hopefully not a few of you will join me on the ride. I’m just going to need a little rest these next few weeks before the next stage (or year) of this journey we call life. Very proud of your work. You represent the industry proudly, and are a fine example for young artists.